I find March to be a very fickle month. In this part of the world, poor thing just can’t make up its mind about the weather. There were consecutive days of blustery wind and pouring rain. Then the sun broke through the clouds, touching everything with the warm glow that can only be seen after a clearing storm. In the meantime, the wildflowers have been taking full advantage of the rain and blossoming everywhere, free and playful in the wind, beckoning me outdoors. After sunset, as it gets colder, I reach for those knitting needles. I only knit a little everyday, so my projects take awhile to finish. I have made good progress on my husband’s pullover. 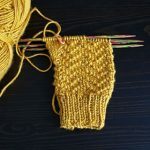 I restarted those mitts, I like how the current pattern displays this busy variegated yarn. Recently I shopped a little for next winter. Completely swayed by the name Yorkshire Skies, I got this beautiful yarn. It has the shades of soft pastel aqua, with a hint of faded purple and a light steel grey. I already know the set of mitts and hat I will be making with this one. I adore these tiny samples of yarn. I got 240 yards total to make a pair of mitts with them. 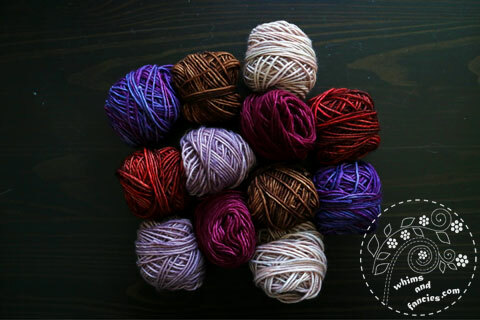 It will be my first multi-yarn knit with the colours of dahlia purple, cardinal red, parchment, light sugar plum and log cabin brown. I wish I had a tiny basket to put these in! I am venturing into the grown-up knitting world with this one. I got a whole set of plum yarn skeins to make a cable pullover for my husband per his request. 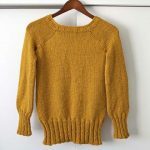 I had fun shopping for the yarn and the pattern. It is nice to have those warm woollies to don since we have been putting our hiking boots on and heading out right after work. Rain or shine. I am learning to take close-up photos of wildflowers. The afternoons have been extremely windy, making it very hard to get good portraits of the flowers. They are also very small, sometimes no more than a few millimetres. It takes a long time and a lot of patience, along with crouching in odd positions, waiting for the wind to die down a little. One of the trails we go to is also a dog park. The dogs see me crouching at their level and they come by to play with me, running around me while trampling the flowers. Their joy is so infectious that I can’t help but laugh out loud and play along with them. Once they move on, I find a different set of flowers and start the process all over again. It is a lot of fun, you have to take my word for it. If you don’t see me here too often, you know where I will be, at least as long as the wildflowers are on display! I hope to see a few photos of spring in your part of the world on next month’s Wandering Camera link-up. Such pretty pretty yarns. I’m not a knitter but I do enjoy the colors and textures of yarn so much. Spring here in Colorado can make up it’s mind. 70 degrees one day and warm enough for patio drinks with a friend. Then 30’s and 18″ of snow the next. Needless to say the flower aren’t showing yet but the trees are trying to wake up. They just don’t know if it’s truly spring yet. 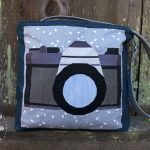 You’ve got some simply lovely projects started there! Love the look of the pullover. 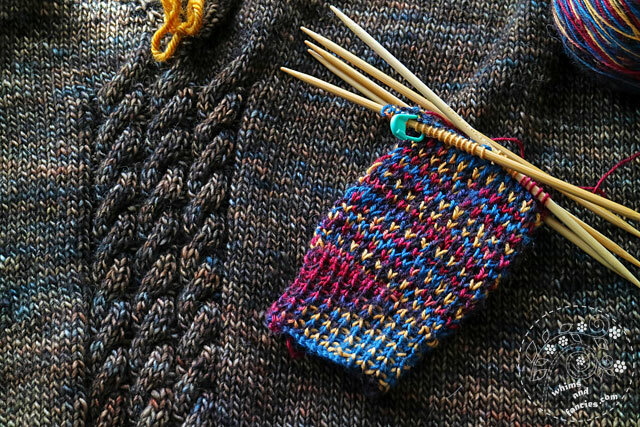 I love the knitting projects you have got going on and you have such a lot of delicious looking wool to work with. I also love your floral close-ups….that is a passion of mine as well (I had a giggle at the tribulations of photographing in the wind because I experience exactly the same thing). 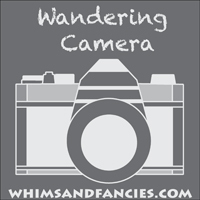 I am going to add your Wandering Camera meme to my linky page on my other blog….Cath@Home….that is were I post my photography and stories of my everyday life. I am so pleased you dropped by for Design Board Monday and it was wonderful to ‘meet’ you! I have been putting off knitting, but as soon as I saw this post I was motivated to knit a few rounds. Your knitting and your colour choices are beautiful. That Douglas Iris is beautiful, too. I love the wools your have choosen for those first two projects. Our weather likes to mix it up for us too. 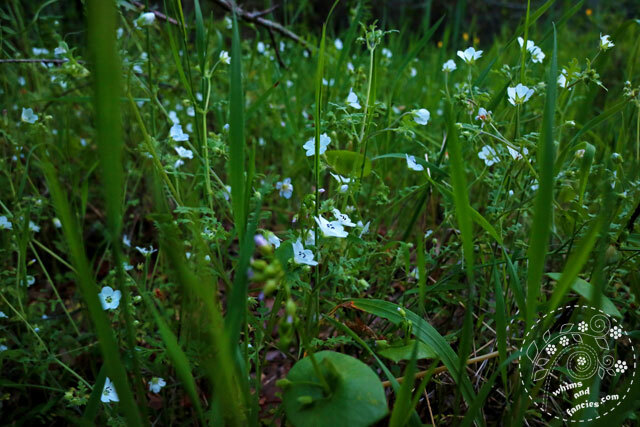 Your yarn and wildflower photos are so beautiful :) And I can imagine what fun you have with those pups when you dare to get eye-level with them! I am afraid we have canine paws and paw prints all over our flowerbeds too which is why I always plant sturdy marigolds though I am not a fan of their aroma! Went through 1/2″ to 3/4″ inch hail yesterday on the way home from an Easter family gathering so I guess Spring isn’t quite here yet…my daffodils disagree though! All that beautiful yarn is so tempting and I love a nice woolly hat, but where would I keep a knitting stash? Your flower photos are great – especially if you are taking them on windy days: you are clearly very patient. Oh what a paradise your part of the world is, Soma. No wonder you can often be found hiking with your camera in tow. The wildflowers are so pretty. Love, love, love the buttercup. It looks stunning against that gorgeous background; such a beautiful shot. As for all your woolly things…your husband’s pullover is lovely with that variegated wool and cables…oh how I love cables! You are so right, “Yorkshire Skies” couldn’t be anything but beautiful, could it…such a beautiful blend of hues. 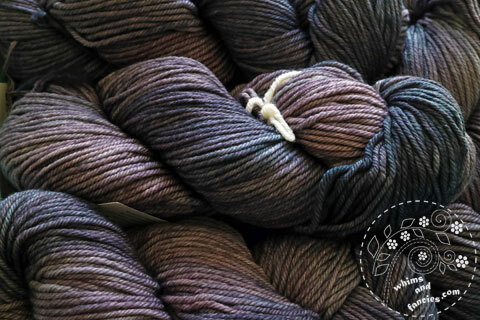 And….I adore the name “Dahlia purple”….the very name would tempt me to take a few skeins home with me. Oh those photos of yarn have me drooling Soma. Yorkshire Skies would have sold me instantaneously too. they picked the perfect name didn’t they? 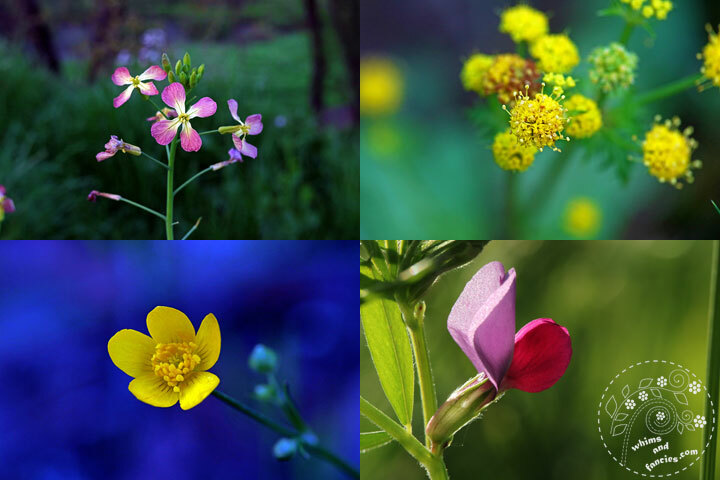 You wildflower photography is so beautiful – you have captured every tiny detail. You had me laughing over your description of your dog pals at the park. I love when that happens! Your photographs are beautiful! The colors are so intense! I love the sweater, Soma. That looks like Madelinetosh Yarn. Gorgeous! O, all that beautiful yarn makes me want to knit. 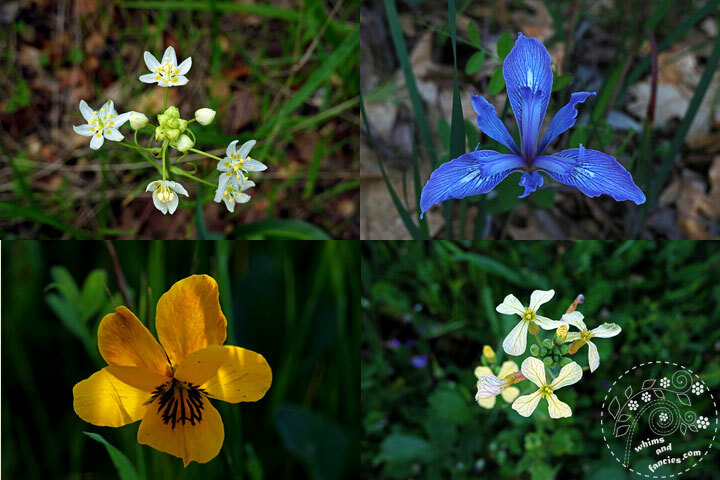 Thanks for sharing the stunning wildflower pics. And your yarn “head shots” are beautiful and so professional looking! I imagine you have to wait until the kitties are all napping, until you can arrange and pose these pretty yarns for their photos! I love Spring flowers. Can’t wait for them to show up here in Michigan. My crocuses are up and blooming and lots of green leaves are beginning to make their way up from their winter hideaways. Like they say, April showers bring May flowers.